Heuchera are versatile and tough perennials that grow short in height but have the ability to brighten up shady areas in any garden. This is due to the fact that their foliage is brightly coloured and retains its shades throughout the year. Marmalade is a compact variety that forms a neat mound of ruffled leaves, reddish-orange in colour. It is suitable for mixed borders and garden containers. Marmalade adds beautiful warm colours to a garden. It features deeply-lobed or maple-shaped leaves that are heavily ruffled or wavy at the edge. The leaves emerge and retain amber-red colour with pinkish undersides. In summer, tall panicles of small showy brown flowers bloom all over the mound of Marmalade. These flowers attract bees and butterflies, adding wildlife interest to your garden. Due to the shape of its flowers and exotic foliage colours, Marmalade is also known as the Coral Bell. It prefers shady spots in a garden, although it performs well even in full sun. Plant it in any soil, it is adaptable to all but the extremely wet ones. An exposed location with winds is not an issue for this Heuchera as it can tolerate extreme weather conditions. An easy to grow perennial, even for seasoned gardeners. Marmalade does not need much pruning other than simple trimming of any fading or damaged leaves in spring. Water moderately between dry periods. Heuchera Marmalade looks stunning in front of a border. Use it to brighten up dull or shady corners of your garden. Group it in a mass planting and watch how it adds stunning colours in your courtyard garden. 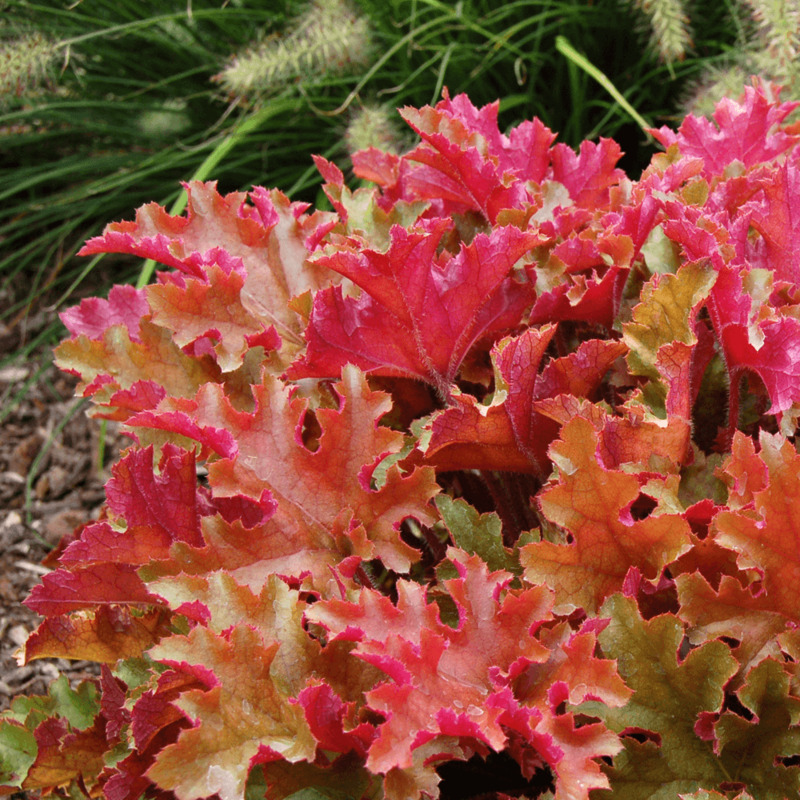 Use it as ground cover under taller shrubs or in containers.